The Fredericton Royals have partnered with the SPCA, Animal Essential Pet Store & Pro Series Ultra Health Pet Food to present our first ever “Bark at the Park: Bring Your Dog to the Game Day”. 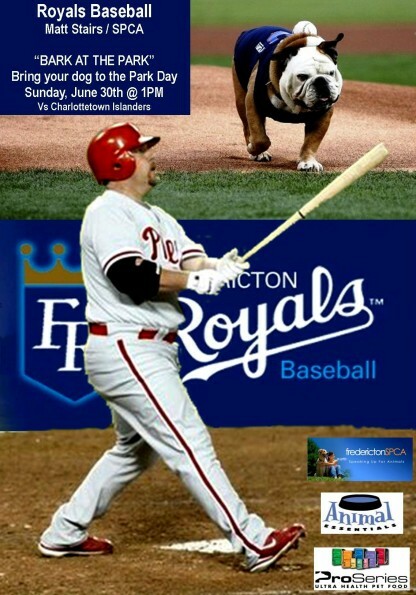 This Sunday afternoon, June 30th @ 1:00 pm the Royals will host the Charlottetown Islanders and fans are encouraged to bring their dog to the park. He or she watches the games at home at your feet – this weekend you can bring your most faithful sporting buddy to the game for an afternoon of fun with some other furry friends. There will be Pro Series Dog food samples for the 1st 200 fans through the gate. There will be over 100 additional pet prizes from Animal Essentials and Royals Baseball. As part of the day we ask that if you would like to make a donation to the SPCA you can bring it to the field where they will have representatives on hand. Please see the list below for items they currently need.